Since starting at WGU last year, I’ve wanted to have an app for my Android phone that would let me keep tabs on the communities, read postings, track my degree progress, and view the CoS for whatever course I was in. As I couldn’t find an app to do this, I wrote one. I’ve been using it for a while now, and it seems to work well enough for me. I can offer no guarantees that it will work for anyone else. That said, I figured I’d post a download link for anyone that might want to give it a try. Again, no guarantees! I call the app “Pocket WGU” (I know, not terribly original). It is a native, Android 2.0.1 (Donut) application that communicates with WGU servers to retrieve data and format it for consumption on the mobile phone. This app can only be installed on Android 2.0 or later, it will refuse to install on earlier versions of Android. If you do give it a try, please post your thoughts to this thread or send me an email. Please remember that this is not an official WGU product or service. This is just an app that I (a student) created to make my life easier. Don’t bug WGU for support if something doesn’t work. 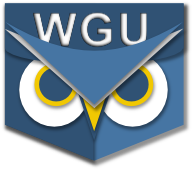 Since then, PocketWGU has seen numerous revisions, expanded to run on many versions of Android and iOS, and is now used by over 5,000 WGU Students! The DevTeam wishes to offer its sincere thanks to the many people that have helped keep this app alive, and to make it better with each passing month. Here's to many more students and many more years!